PowerApps will be added as the trigger for your flow (note: the trigger is a bit misleading, but that is actually the PowerApp trigger). The workflow is going to be exactly like the one we did in Part 9. There is one significant difference. 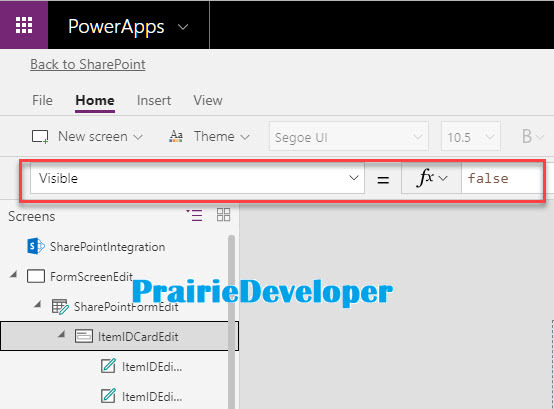 We are going to have to get the item ID from PowerApps, not from SharePoint as we did in the previous post. Add the SharePoint – Get item action. 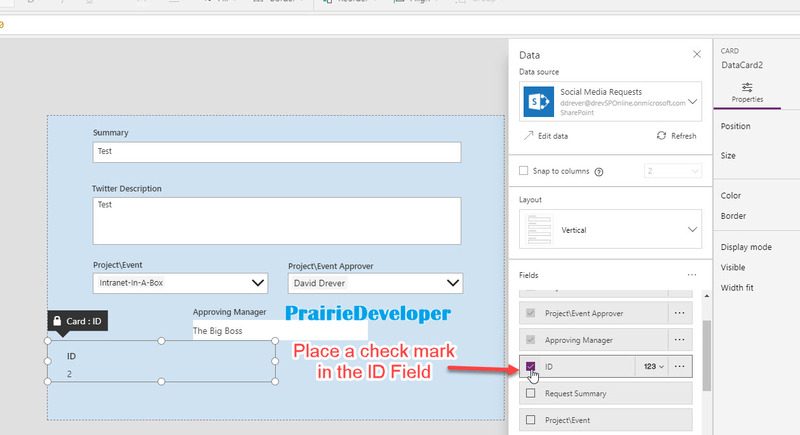 This time when you add the ID to the Id field, you won’t be presented with the SharePoint list item ID. You will only have Ask in PowerApp. 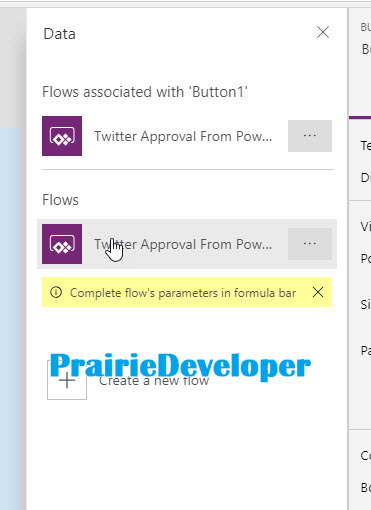 This means that Flow is expecting the value it needs to come from the PowerApp. When you click on this option, Flow actually inserts the option (Getitem_Id) into the Id field of the action. This means it is expecting the Id to come from the PowerApp. I won’t cover the rest of the flow steps here. You an review them in Part 9 of this series. To get this Flow to run, we need to pass the ID of the list item to the flow when called. 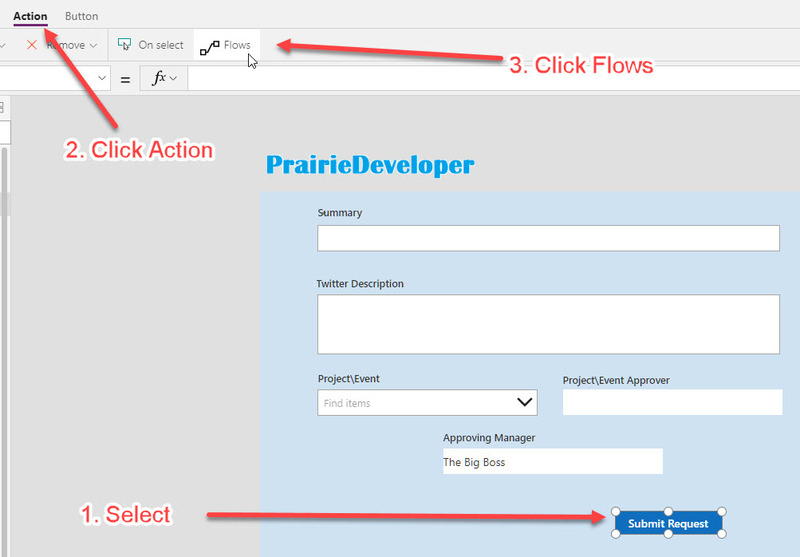 Next, add the flow to the PowerApp and associate it to the button by ensuring the button is selected and clicking on Action and Flows from the ribbon. Scroll down the object selection window that slides out and place a checkmark beside ID. Next, since we don’t actually need to show the field (but you can if you want of course) we are going to hide it, but updating the visible property to false. You can now run the button and it will execute the flow. As shown in this post you can’t kick off the flow from the new form because you don’t yet know the Item ID. You can get around this by firing the flow in the edit form transition. I’ll write about doing this in my next Flow post. This is the final post in my series, but not the last for this application. I intend to use this solution to build other posts to show you the things you can do with PowerApps and Flow. One of the items I don’t like about the default setup for using PowerApps to customize a SharePoint form is that the data cards are cumbersome on the canvas. I will show a better way in my next PowerApps blog. The intention of this series was to show you how easy it is to build a low-code solution in SharePoint with the tools that Microsoft has built. There are great enhancements all the time so things are going to get better and more efficient. I hope this series helped you.